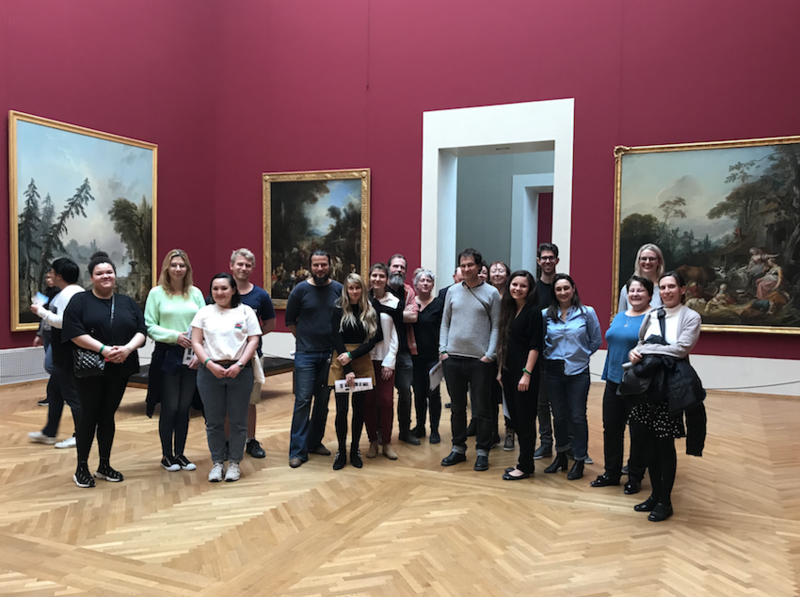 On 23 March around twenty OU students gathered in Munich for a study day and tour of the Alte Pinakothek. 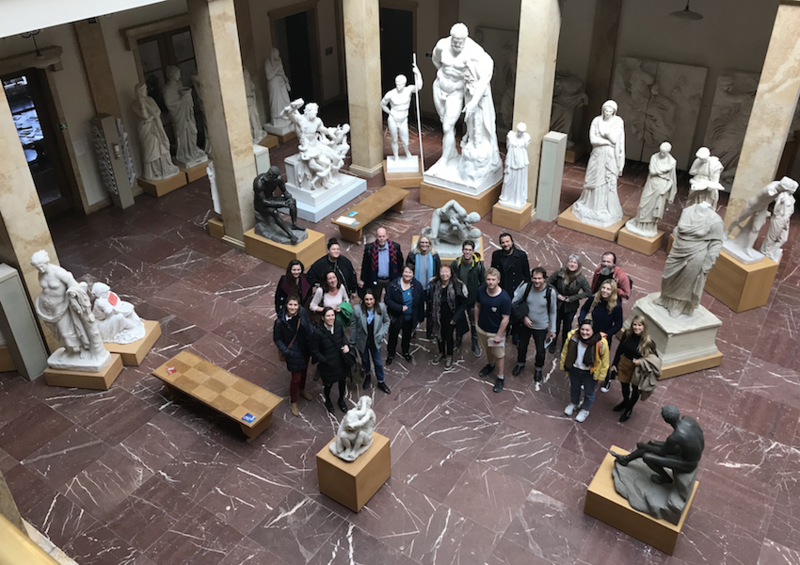 Tiffany McKirdy, an AL on AA100 and A105 , and Kathleen Christian, Senior Lecturer in Art History, organised the trip for Europe-based students studying on AA100 and A105. 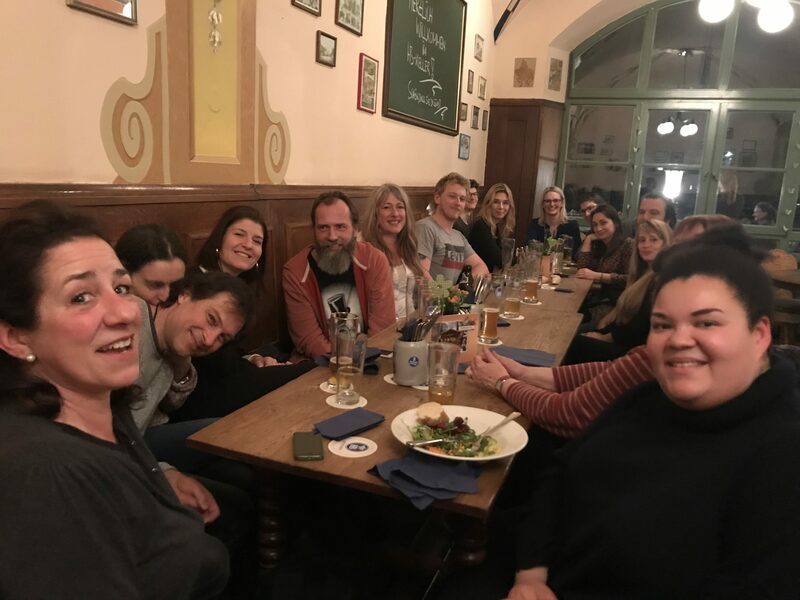 Tiffany had worked with all the participants already in her tutorial groups, while Kathleen provided the connection to Munich, having spent time there with an Alexander von Humboldt fellowship. The event kicked off on Friday evening with greetings and a few of the beverages Munich is most famous for in the Hofbräukeller (it wasn’t yet the season to sit outside in the beer garden, but we were close!). 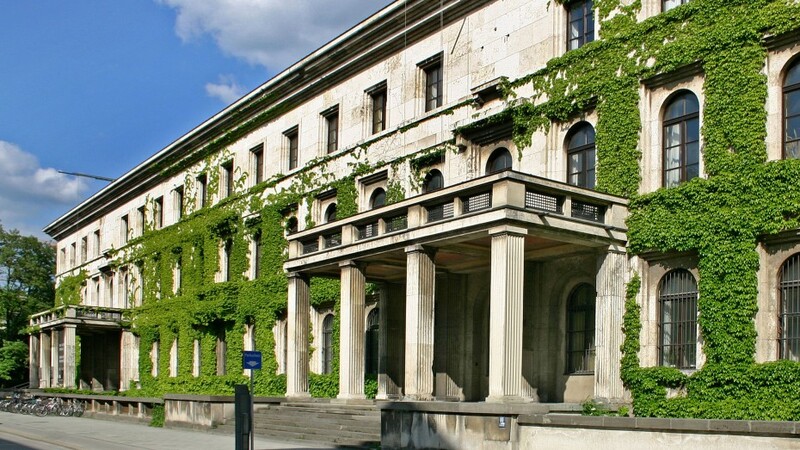 On Saturday morning we met at the Zentralinstitut für Kunstgeschichte, an institute in the centre of Munich devoted to research in art history. The director Dr. Ulrich Pfisterer, who had been Kathleen’s host during her Humboldt fellowship, kindly offered us the use of a classroom. Being in the Institute was a special experience, since it has a fascinating history: in 1945 it was used by American forces as a ‘Central Art Collecting Point’, where works stolen during the war were collected, conserved and repatriated (think ‘Monuments Men’). Ever since the 1940s it has been a research institute devoted to art history. 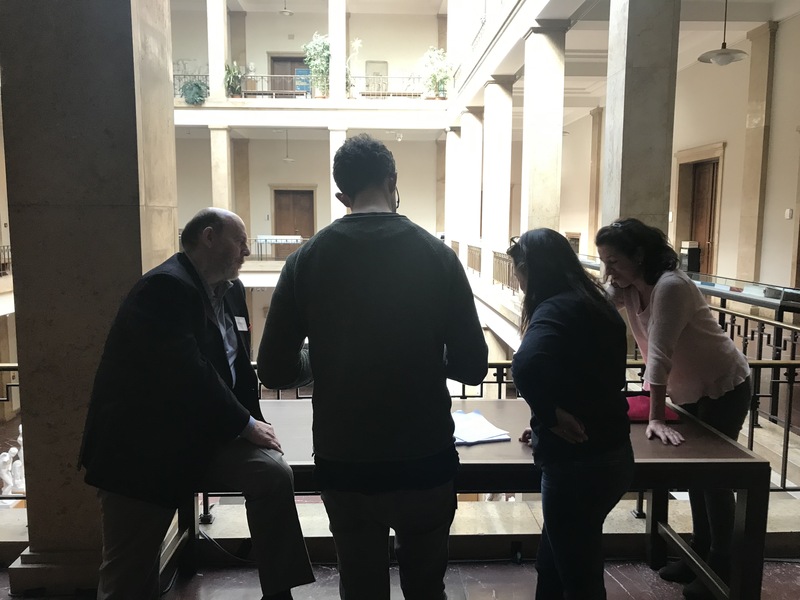 In the morning Tiffany led a lively classroom session in which the group were divided into two teams, arguing either for or against the repatriation of the Parthenon Sculptures. Tiffany gave a short introduction, reminding students of their study of Benin in AA100 and looking ahead to the study of philosopher Dr Kwame Anthony Appiah’s cosmopolitanism in Book 4 of A105. Three students had volunteered to be judges, and they also took on the responsibility of making tea and coffee for everyone while the teams devised their speeches. A representative from each team spoke for 5 – 10 minutes and after a brief deliberation by the judges, the winners were announced. After a trip to the Marienplatz, the city centre of Munich, and some time eating lunch and walking in the gorgeous sunshine, the group headed to the Alte Pinakothek, Munich’s world-famous museum of ‘Old Master’ paintings. Here Kathleen led a tour focused on about twenty of the works, including paintings by Dürer, Titian, Raphael, Leonardo, Van Dyck and Rubens. We covered a lot of ground in an hour and a half and surveyed several centuries of art history, looking for example at the differences between Early Netherlandish and Italian works, and between painting on panel and painting on canvas. Among the student favourites were Dürer’s famous Self Portrait, Aldorfer’s Battle of Alexander and Darius at Issus, and Boucher’s very Rococo portrait of Madame de Pompadour. 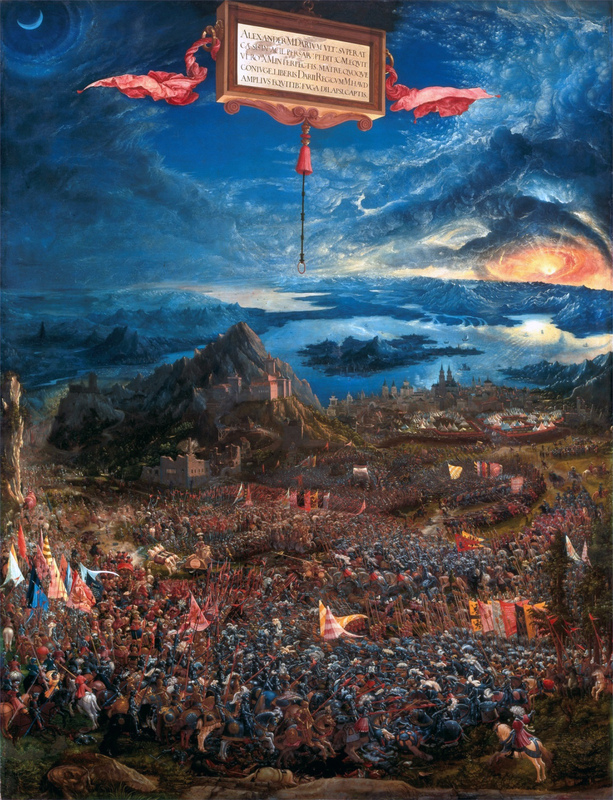 Altdorfer’s large history painting, shown below, is a fascinating depiction of Alexander the Great’s defeat of the Persian King Darius, famous for its bird’s-eye perspective, dramatic landscape and teeming battlegound. ‘The whole experience was wonderful and it has given a new dimension to my course. I feel closer to my tutor and to the other people on my course, and this means a lot to me. I enjoyed everything about the day, and I think the dinner the night before was a great part of it. 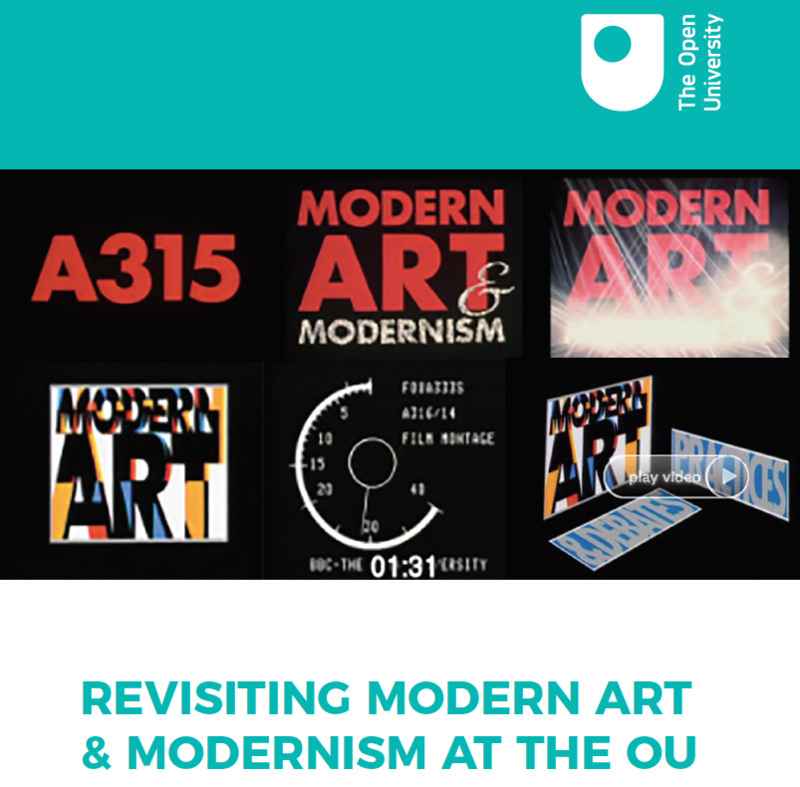 2019 marks 50 years since the founding of the OU and the Art History department will be offering a number of events to celebrate. Drawing on the OU’s pioneering and world-class research in this field, the courses have helped position the OU as a leader in the development of an innovative and influential curriculum for the understanding of modern art, and has led to the production of publications such as the indispensable anthology Art in Theory. 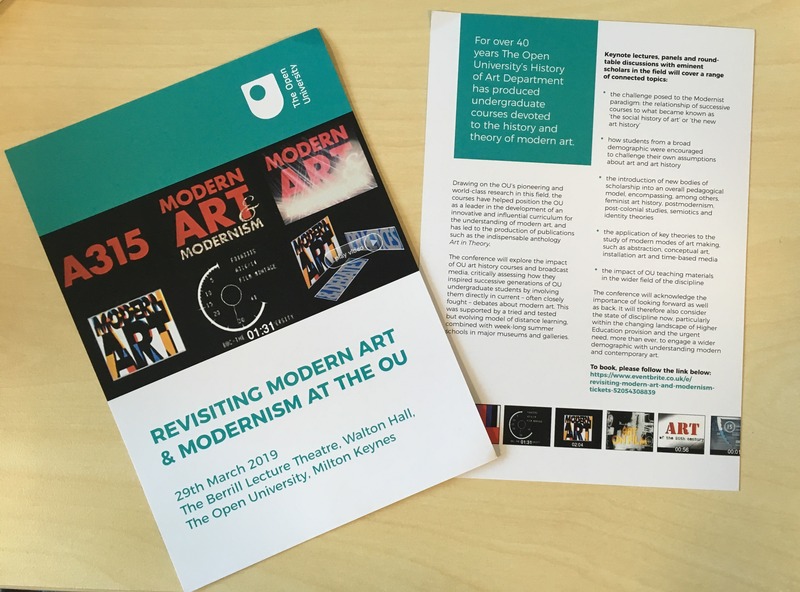 The conference will explore the impact of OU art history courses and broadcast media, critically assessing how they inspired successive generations of OU undergraduate students by involving them directly in current – often closely fought – debates about modern art. This was supported by a tried and tested but evolving model of distance learning, combined with week-long summer schools in major museums and galleries. The conference will acknowledge the importance of looking forward as well as back. It will therefore also consider the state of the discipline now, particularly within the changing landscape of Higher Education provision and the urgent need, more than ever, to engage a wider demographic with understanding modern and contemporary art. The OU and Art UK are pleased to announce a new partnership, through which Art UK will share Open Arts Objects films across their site. So while you’re browsing one of your favourite paintings on ArtUK you might just find one of our films readily available for you! The Open Arts Journal addresses the demand for a rigorously compiled, peer-reviewed platform for arts scholarship that is open to diverse participants. 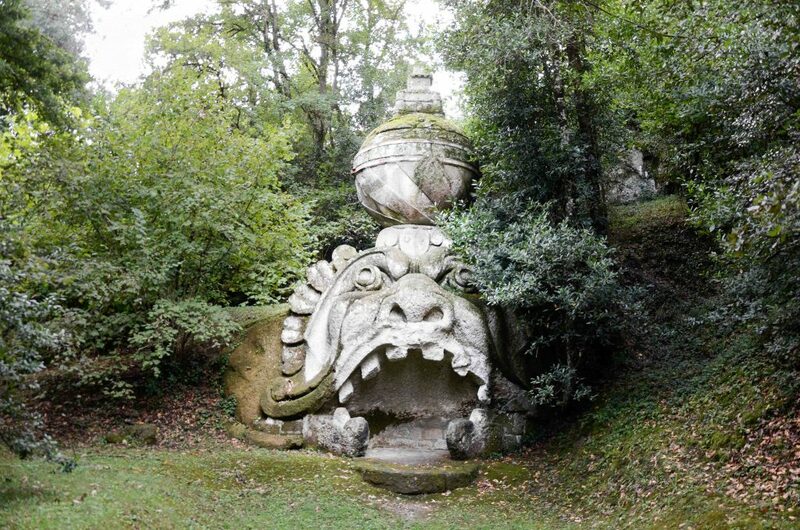 If you don’t know already, one of the open access resources coming out of the department of Art History at the Open University is the Open Arts Journal. 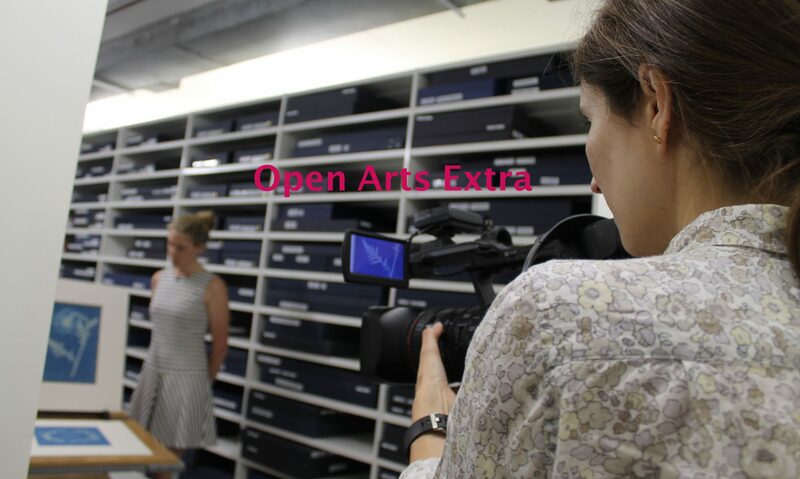 Published by The Open University, the Open Arts Journal – www.openartsjournal.org – addresses the demand for a rigorously compiled, peer-reviewed platform for arts scholarship that is open to diverse participants. Its dissemination is global, spanning multiple communities including practitioners of art, architecture and design, curators and arts policy-makers, and researchers in the arts and heritage sectors. With a broad base of interests the Open Arts Journal emphasises innovation, in both content and medium and by virtue of a bespoke digital design. Its contributors encompass a wide range of scholars, from academics to critics and practitioners, with original visual essays and polemics; reflections on art from curators and artists; and the fruits of theoretical, historical or longitudinal research. Each edition tackles a key theme, issue or critical debate. Each issue is downloadable free and without subscription or registration. The Art History department has always been dedicated to providing open access Art History materials. For an overview of what we do, check out our previous blog on widening participation and open access. It shows Jackson Pollock’s famous painting Frieze (1953-55) the way only collectors can afford to see it, in a domestic setting, hence the association of her work with institutional critique. For me the juxtaposition with this eighteenth-century tureen is particularly interesting, as it connects the art work as commodity in the present with the trade in porcelain and so-called export art, that is Chinese vases, dished and other domestic objects that were produced especially for the European market and sought to adapt its shapes to the European taste. This work, much like Lawler’s, thrived on appropriation and translation, resulting in often curious mixtures and creative interpretations of patterns, designs and shapes. 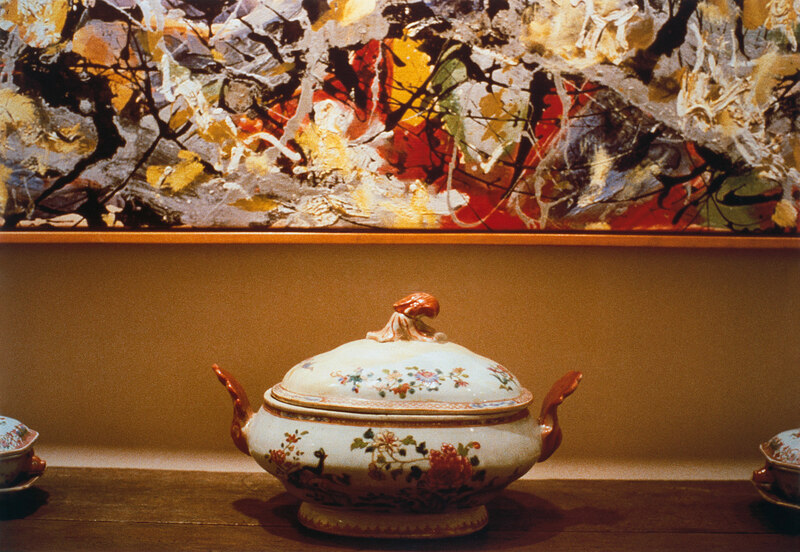 The extreme cropping of Pollock’s work, which in a sense becomes the backdrop for the tureen, shows the painting much like the tureen as a decorative object in a private space, that is as a commodity. Yet what makes the image so famous is the presence of Pollock’s painting, a clear sign of status. Historically speaking, porcelain dishes, however, used to occupy just such a place of privilege, not on the basis of artistic genius, however, but of the ‘exotic’ status of porcelain, that is the materiality of the dish, and its association with the ‘East’. Pollock, of course, also drew on ‘other’ visual practices, in particular native American Indian art, which this image also alludes to, if maybe somewhat obliquely, which is why I picked it. This perspective reflects my work for A344 ‘Art and its Global Histories’, the new third level course for art history which launched in October 2017, which explores the movement of visual objects between cultures in respective cultural and political contexts and shows how central Europe’s global contacts and transcultural exchanges were for the forging of its art. I have edited and co-authored one of its course unit ‘Empire and Art: British India’. For me Lawler’s image also makes indirect allusions to the practice of appropriating the work of artists for decorative schemes on ceramics. I have explored this with regard to nineteenth-century prints representing Indian scenes on a Staffordshire meat dish on our OpenLearn Unit Travelling Objects. If you are interested in exploring the global contexts of Chinese porcelain further, you will find a discussion of Chinoiserie and of the global commodity trade in Art, commerce and colonialism 1600–1800 as well as the earlier reception and collection of porcelain in the Renaissance in European Art and the Wider World, 1350-1550. Why does Art History Matter To You? 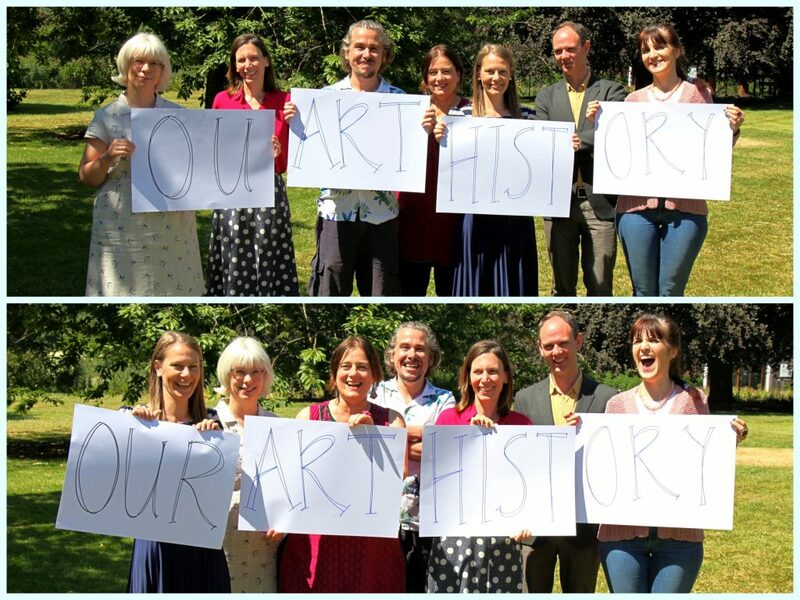 Along with the films we’ve done of curators in museums and academics from the Art History department at the Open University, we also put a call out to the general public on #whyarthistorymatters. You can see more of these films over on our YouTube channel. An assignment I wrote on public sculpture and in particular Henry Moore’s piece Old Flo, caused me to become engaged with the campaign to rescue the sculpture from the open market […] the sculpture has now been saved and sits in Canary Wharf at present. My background was as a town planner for public authorities, but early retirement caused me to re-think my career. I started with undergraduate OU Art History modules then went on to take the MA Art History which I completed in September 2017. The first year involved theory and research methods giving me a strong academic footing; the second year was an excellent mix of research projects leading to a final dissertation. My interest in public art and architecture with a strong social bent caused me to use primary source material in local archives and buildings local to my area. As a result, I have extensive research on two important local building complexes, which are to be turned into local history talks on the newly re-furbished Piece Hall in Halifax. An assignment I wrote on public sculpture and in particular Henry Moore’s piece Old Flo, caused me to become engaged with the campaign to rescue the sculpture from the open market, having discussed it with the artist Bob and Roberta Smith. The sculpture has now been saved and sits in Canary Wharf at present. I am in discussion with the Press Officer of Tower Hamlets LBC, who wants the work to be revised for general public consumption. 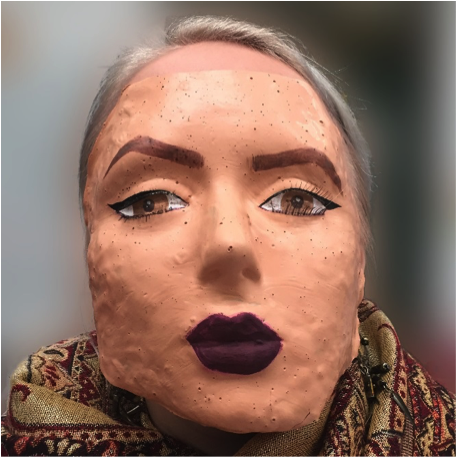 The Art History MA has given me a new direction and the confidence to research and write articles and present talks, propose and prepare exhibitions, and to actively engage and promote the social history and culture of my town. I am now, with colleagues, preparing an exhibition at the local Halifax textile museum, The Bankfield, called ‘Women Travellers’ involving the collector, Edith Durham, who donated all her Kosovan and Albanian collection to the museum. I travelled to Kosovo and Albania in her footsteps this year to visit textile and ethnographic museums to support the preparation of the exhibition. I have written the interpretation panels for the exhibition. 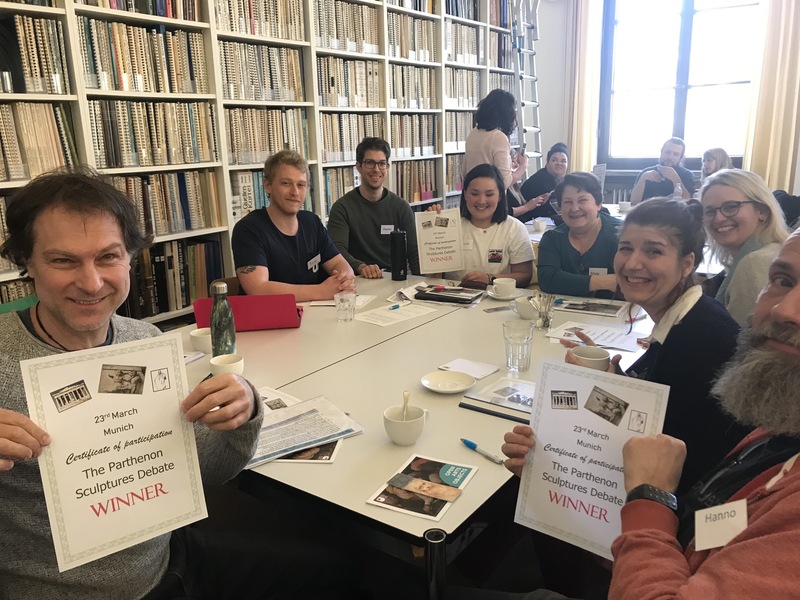 My OU work has stood me in good stead for the research of this, together with the practical aspects of mounting an exhibition and the community outreach work, in preparing talks and discussion groups with refugees from the area. I am delivering a talk on the exhibition, together with a colleague, to the Art Fund in November. I am also delivering guided tour talks on local architecture over the Heritage Open Days this September in my town. I hope to take these experiences further to engage in local art projects and campaigns.The Art History MA has given me a new direction and the confidence to research and write articles and present talks, propose and prepare exhibitions, and to actively engage and promote the social history and culture of my town. Someone once asked me if I could do a degree what would I do it in and I said ‘Art History’… at the time I had no idea whether such a degree pathway existed but some years later when my daughter said “mum there is an evening class doing an A Level in the History of Art at South Devon Technical College” I got really excited and signed up without hesitation. I did really well in that and for the first time in years I felt really engaged and alive. I was bitterly disappointed not to be able to complete the second year because they withdrew it due to low numbers but another friend said “do a degree in it!” At first I thought “what a preposterous idea” but that seed was sewn and when I seriously started exploring that possibility I took a deep breath and decided to sign up for AA100 in 2013. That was five years ago and in October I start my final module AA315, Renaissance Art Reconsidered, and I cannot believe that at long last that degree is in my sights. Art history matters to me because it teaches you to question and challenge what you hear; it can overturn stereotypes and expands understanding of so many things because of that cross over with history, politics, classical studies, religion etc… It has extended my mind but more importantly it has given me a voice and an avid enquiring mind that I never had before. I would never have had the confidence before to take part in conversations about so many things that cross my path day to day. I completed module A344 Art & Its Global Histories in June and I am ashamed to say that prior to completing that I had no real sense of Britain’s colonial past. What I learnt opened my eyes to past histories and wrongs; helping to give me gain a better understanding of ongoing global hostilities. I completed module A344 Art & Its Global Histories in June and I am ashamed to say that prior to completing that I had no real sense of Britain’s colonial past. What I learnt opened my eyes to past histories and wrongs; helping to give me gain a better understanding of ongoing global hostilities. This becomes recognisable when looking at other people’s culture like the hierarchy evident in casta paintings and how people of mixed racial identities have been marginalised, which I discovered when studying Primitivism and Picasso also. When I visit an exhibition now I think about its curation; I think is there a bias?- is it fair and representative to all? – which I would have never questioned before. So studying Art history makes you a more democratic individual and it is not that you didn’t have the same sense of right and wrong before – it is just that art history opens your eyes to invisible things. It has extended my mind but more importantly it has given me a voice and an avid enquiring mind that I never had before. I would never have had the confidence before to take part in conversations about so many things that cross my path day to day. So much about art, architecture and our visual culture underpins our nation’s sense of national identity; revealing moment’s peculiar to our history that are both bad and good. Art can convey power and prestige and has been used as a powerful tool to speak about our place in the world and studying it has opened my eyes to those inherent socio-political statements. Britain has such a wealth of art history and my husband Jeff and I get such a buzz exploring it and that passion for going out and about exploring stately homes. Visiting exhibitions etc… has just been amplified by the modules that I have done. For example in module A226 we studied about Viscount Cobham and Stowe and after that I was on a mission to see it-and the Temple of British Worthies and the Palladian bridge -which was appreciated all the more because of the context I had gained studying about it. So studying Art history makes you a more democratic individual and it is not that you didn’t have the same sense of right and wrong before – it is just that art history opens your eyes to invisible things. The final thing I would like to say about studying art history is how I think it has helped me grow as a person and how that has had a knock on effect with my family. Last September my daughter now 29 started studying Radiography at Cardiff and my son now 24 started studying Osteopathy at Marjon’s University in Plymouth. We have all come to education a little late – but my passion for art history has inspired them because they can see the effect it has had had on me and that has made them more aspirational themselves. -Amanda Noble, OU student and Directorate Secretary, Torbay & South Devon NHS Foundation Trust, Radiology & Imaging Directorate. A344, Art and its Global Histories is a new third level module at the Open University. Its textbooks, co-published with Manchester University Press have been widely adopted across the world in the teaching of a global Art History. For our Art History undergraduate courses check out the OU’s online prospectus. 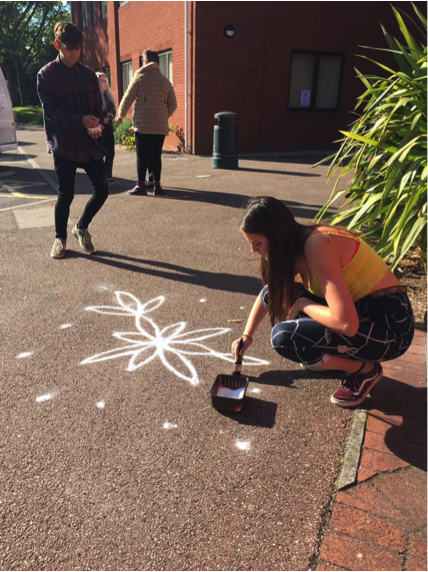 Thank you for sharing this fascinating project in your blogpost, I am so pleased that my discussion of women’s street art in Tamil Nadu inspired you to do this, and by the looks of it, the students really enjoyed it too. There are a few things I did not get around to discussing in my text for the MA in Art History at the Open University, so allow me to add a few comments here. You mention the creativity with which students approached the drawing of the designs by using paper cones etc… rather than executing the designs by hand in the traditional fashion. In fact this is very much the spirit in how the drawing of these designs is approached in India as well. 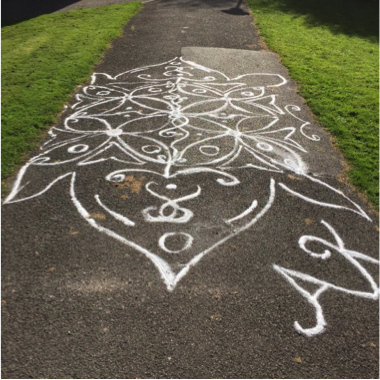 I discussed the practice as it is traditionally executed, but in busy, modern day India, easy approaches to producing such designs have been devised, such as the use of stencils and stencil rollers. You can also buy plastic stickers that you can simple attach to the desired space, and I have even seen a small robot programmed to draw such designs on the Internet. Your students therefore well and truly entered into the creative spirit of engaging with this practice! I also was not able to show some more modern-style Tamil designs, nor to give examples of the traditional designs in other parts of India which are more representational than in Tamil Nadu, as you also mentioned to your students. The drawing of animals, particularly the peacock or birds, and of flowers, and all manner of other objects are commonly found in such designs, and, depending on the regional tradition, might lean to a greater or lesser degree towards abstraction. Yet there is no sense of individual ownership of the designs, which really does challenges one’s assumptions about art and visual practice and brings home some key aspects of what Eurocentricity in the arts entails. Questions of authenticity, which you discussed with your students, are also central issues in this regard, so great to see this raised. 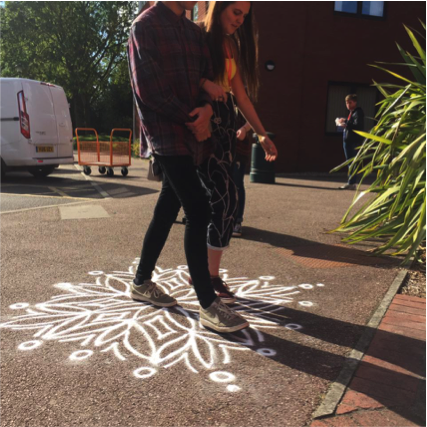 I was also very interested in the placing of the design on a speed bump, this is an intriguing engagement with the ephemeral aspect of the tradition, and I loved your ‘Post-Kolam’ challenge – what exciting work, thank you for sharing! I was fascinated to explore these sorts of ideas whilst studying for an MA in Art History with the Open University. Indeed my final dissertation explored the problematic identities of Western and non-Western art production and consumption…Off the back of this research, I wanted to challenge my Extended Diploma in Art and Design students’ assumptions about art. When is housework art? 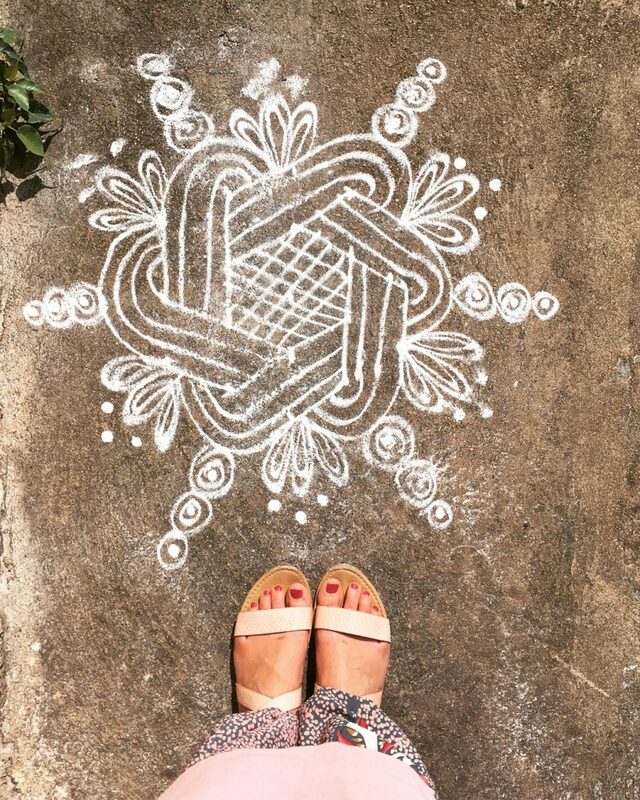 The makers of kolams (designs rendered in rice flour or chalk powder on the streets of Tamil Nadu, India) consider their efforts housework. As a routine daily activity, it certainly has a resemblance to housework. However, to our Western eyes, it seems more like art. It has many of the elements and values we might look for in art such as sensitivity of line or composition and structure; values that are shared by the makers too. It is what separates kolams from a Western perspective of art that reveals our entrenched restricted ideas about art. Those ideas include notions such as: art has an artist, art is special and separate from daily life, and art is made to last. I was fascinated to explore these sorts of ideas whilst studying for an MA in Art History with the Open University. Indeed my final dissertation explored the problematic identities of Western and non-Western art production and consumption. I am indebted to Renate Dohmen, whose research into kolams was an inspiration for this study. Off the back of this research, I wanted to challenge my Extended Diploma in Art and Design students’ assumptions about art. 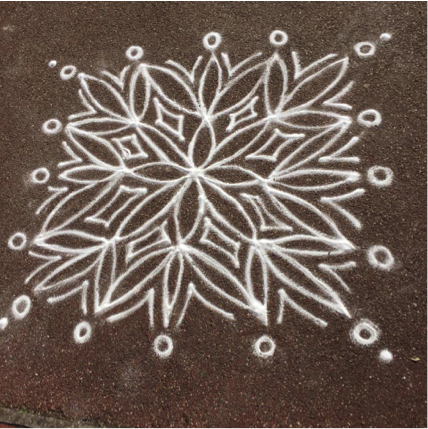 After introducing them to the traditional dotted grid structure and abstract designs, the technique of pouring the flour, the street, path or doorway location and the ephemerality of the work, students set to their own kolam designs. We used salt rather than rice flour or chalk, but otherwise students were asked to undertake the task in as ‘authentic’ way as possible. Mindful of their assumptions and previous training in art, it was interesting to see how they responded. The technique was the first deviation. Granted, the students hadn’t been practicing since childhood as the makers from Tamil Nadu would have. However, that the students felt at liberty to fashion cones out of paper to help apply the salt and use brushes to keep stray salt in line, indicated their sense of creative freedom to do things their own way. As they neared completion they became precious about their designs and wary of them being walked over, despite this being an integral part of the kolam’s function. This seemed to indicate their acquired understanding that artistic successes needed to be conserved. 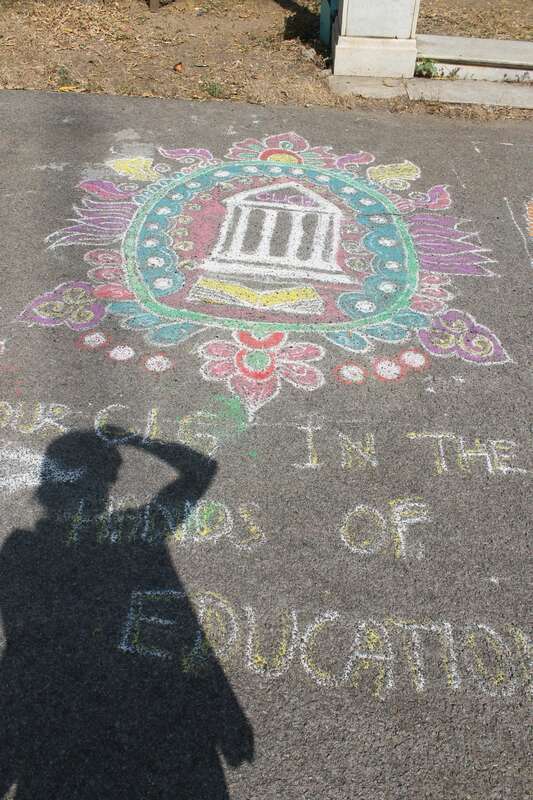 Resigned to the kolams’ fate, one pair of students walked carefully and with purpose arm in arm over their completed design, as if in reverence of the work. This felt like an act of activating the work. They insisted they should be the first to do this which suggested a sense of ownership by the artists. This idea was accentuated by another pair of students who initialled their completed work. This seems to allude to the Western notion of the artist as a genius, whose unique vision rises them above other humans; a notion that many of the students would be aware and accepting of. 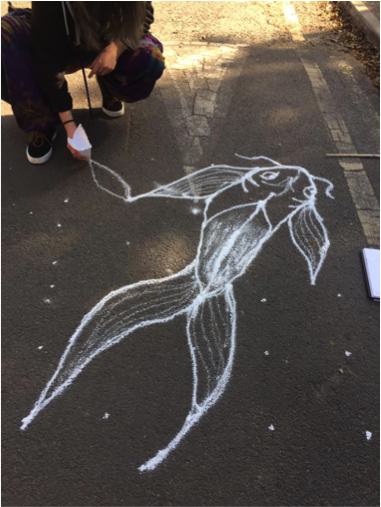 One of the students went beyond the traditional abstract design to create a fish. This deviation was also inspired by a Japanese design. 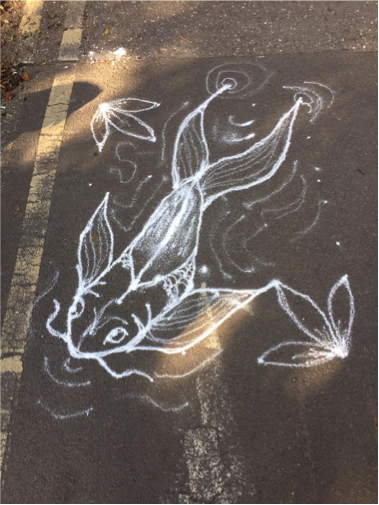 That this fish was depicted on a speedbump gave it a three dimensionality and an implication that it would be worn away by a vehicle rather than by foot. The combination of these variations illustrate an arguably Western preoccupation to drive creativity forward. Why is it all right for a Western artist to appropriate imagery from other cultures when practitioners of other cultural traditions are denied that opportunity if they are to escape accusations of inauthenticity? In other words, why does Western art seem to have a monopoly on creative progress and divergence? A discussion on authenticity followed. I showed the students how kolams evolved to include animal designs, the use of colour and even the use of cartoon characters from Western media. Although these additions seemed to be diluting the authenticity of the kolams, are they really inauthentic? Picasso’s Les Demoiselles d’Avignon seemed an appropriate comparison. Picasso borrowed imagery from African masks. Does that make his work any less authentic as a piece of Western art? Why is it all right for a Western artist to appropriate imagery from other cultures when practitioners of other cultural traditions are denied that opportunity if they are to escape accusations of inauthenticity? In other words, why does Western art seem to have a monopoly on creative progress and divergence? Of course artists of any nationality can and do create work which might reference traditional practices from their own global region in a new way, but often it is only in a Western, gallery centred context where this becomes innovative rather than an affront to tradition. One of the reasons for this is the mismatch of functions. Regardless of contemporary art’s all-encompassing spectrum of practices, the function is still tied to Western traditions and values. True, Picasso did speak of the magic of the masks that inspired him and sought to feed that function into his art, yet it remains that gallery focussed art has different functions from housework. Post-kolam, I set the students a challenge: Inspired by a non-Western cultural tradition, they had to produce work that went beyond merely appropriating imagery. They had to respect the function, purpose and values of their inspiration whilst still making something relevant for a UK gallery audience. 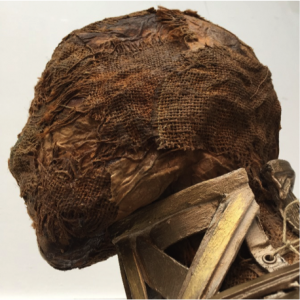 The various results included: an Ancient Egyptian inspired body bag referencing the relationship between Egyptian art and the afterlife and a contemporary Western utilitarian way of dressing the dead; rubber masks inspired by the transformative power of African masks and the physical and emotional transformations offered by cosmetic surgery; and a set of stamps referencing the dynastic similarities between North Korea and the UK and each culture’s apparent blindness to the propaganda to which they are subjected.